Only a two-hour drive from the Maine border, you're in a different country and a different culture. It's only a two-hour drive from Jackman, Maine, USA, to Québec City, Québec, Canada, but the difference in scenery, culture, language and cuisine is amazing. If you have the time and you have your passport with you), Québec City is well worth the excursion. Québec City is the soul of French Canada, as it has been for four centuries. It was the first settlement (1608) of La Nouvelle France in North America, the first major port on the St Lawrence River, and it is the governmental capital of the vast, rich Province of Québec. 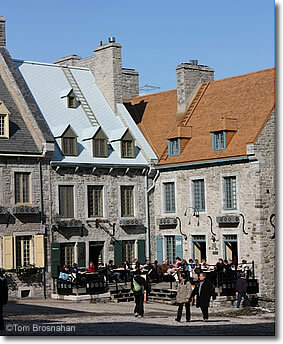 Vieux Québec (Old Québec) is a walled city perched beneath and atop the rocky promontory of Cape Diamond overlooking a narrows (kepek in Algonquin) in the St Lawrence River. Place Royale, Québec City QC.